IN his victory speech after unseating Brian Coleman, Andrew Dismore thanked the independent bloggers who had taken great interest in the Barnet and Camden elections and particularly a general dislike for his Conservative opponent. It was a sign that animosity for Mr Coleman had stretched far beyond the irritations of Labour members. Perhaps a further sign of the stiff resistance he faced in his final months at the London Assembly is the fact there is now to be a special party for all of those who opposed him, all of those who encouraged people to place their vote elsewhere, this weekend. 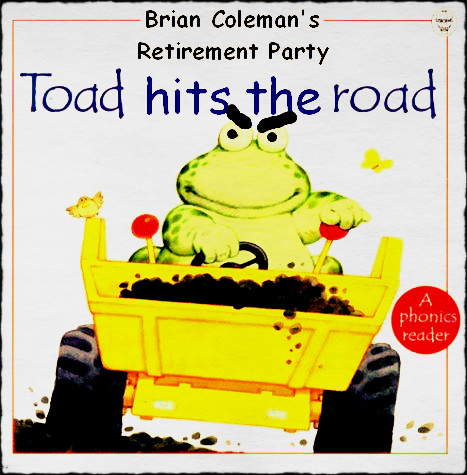 The email invitation doing the rounds is to a gathering on Saturday night titled: Brian Coleman’s Retirement Party, you’re invited, he’s not. It comes with an attachment – a picture of a toad – that makes clear there is no pity whatsoever for the outgoing politician. Mr Coleman always claimed he had been unfairly targeted by online writers.